DURING SUMMER MONTHS OR IF YOU LIVE INA HOT CLIMATE, THIS PRODUCT IS ALMOST GUARANTEED TO MELT IN-TRANSIT. PLEASE CHOOSE OUR SUMMER SHIPPING OPTION DURING TRANSIT TO HELP DELAY THIS OR ONLY ORDER PRODUCTS LIKE THIS DURING COOLER MONTHS. WE ARE NOT RESPONSIBLE FOR MELTED PRODUCTS. Our faces, literally, FACE the elements more than any other part of our bodies. Keeping facial skin clean and clear of toxins and other disruptive exposures is important to maintaining a healthy, glowing complexion. 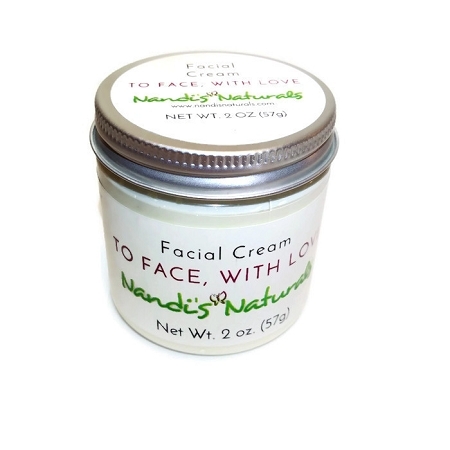 "To Face, With Love," Nandi's specially blended facial cream, is just the right potion for retaining moisture and protecting your beautiful skin from the elements. We've used simple, yet powerful ingredients, to create a facial cream that softens, moisturizes and protects delicate skin. To Face, With Love can be used on multiple skin types, from normal, to oily and dry, and combinations in-between. Mango butter, rich in vitamins A, C and E, is considered non-comedogenic, meaning it isn't likely to cause blackheads or clogged pores. Many use mango butter to smooth or decrease the appearance of wrinkles and age spots, soothe sunburned skin, and moisturize dry, itchy skin. Mango butter comes from the pulp of the mango kernel. An emollient, it protects and conditions wind- and sun-damaged skin as well as skin yet to be "kissed by the sun." One of Nandi's favorite butters, you'll love the way it softens and revitalizes dry skin. Organic jojoba seed oil (actually a wax) closely mimics our skin's own natural sebum. It's rated low on the comedogenic pole as well. This quick-absorbing, non-greasy oil works in concert with the mango butter to keep your skin soft, protected and moisturized. Use: Apply a small amount to face and gently massage into skin. Can be applied as a day or night cream. Use under makeup to help keep skin moisturized. Extremely dry spots may require a bit more, but not too much. Remember, a little bit goes a long way. We highly suggest daily use of this cream on your face, neck and chest areas, as these are the places most likely to be exposed to sun, wind and other environmental exposures. "To Face, With Love" Facial Cream is perfect as an afterwash moisturizer, following cleansing with our liquid black soaps. I love this face lotion. It absorbs quickly and doesn't leave your skin oily! You can hardly smell it. In the past, I've used face lotions that left my skin oily and with an odd scent. This is so simple and you only need a little! I really like this cream and use it around my eyes before I sleep to help prevent wrinkles. It has a rich and luscious texture. Highly recommended. I love, love, love this facial cream. It is smooth and delightful smelling without being oily. It absolutely goes a long way and I use the same jar for over a month (actually much longer because I only need it in the dry seasons). Definitely recommend. Copyright Nandi's Naturals. All Rights Reserved.